Moms have been teaching their children to sew for thousands of years. Children's sewing machines have been around almost as long as regular-sized machines. In the Past, many companies made toy sewing machines that were identical to the adult sized versions. Often in the late 1800’s a girl would sew her own doll clothes on a toy machine while her mother was sewing clothes for the children. Years ago children needed to learn how to sew. The cost of buying clothing was usually more than the average family could afford. Today, providing children with skills that can last a lifetime is just plain smart. Using children's sewing machines opens many avenues for creativity and enjoyment. There are several different types of children's sewing machines available today. Some are designed for young children and are made of plastic. These cheaper children’s sewing machines are toys more than working machines. You may be disappointed with the results from these simple machines. Keep in mind that if you become frustrated with a machine, a child who is just learning will become discouraged as well. I bought a similar machine for my 6 year old son who wanted to learn to sew. We returned the machine the next day. The machine would not sew the simple chain stitch it promised continuously without seizing up! Some young children have excellent eye-hand coordination some, but many don’t. 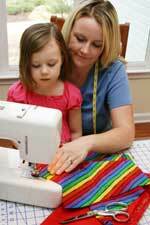 Here are some points to consider when choosing a children's sewing machine. If a sewing machine is easy to run, a child won’t become frustrated. Speed settings are also important. Being able to set children’s sewing machine sewing speeds allows children to take their time when learning and increase sewing speeds once they pick up the basic skills. Be sure that the machine is sturdy. Product reviews can help you decide if the brand you’re considering is worth the money. Once a child learns the basics of sewing, you could introduce a slightly larger machine able to handle bigger projects. I know many of us learned on regular sized machines without a problem. Brother makes a few basic machines that are perfect for older children. The has many features, making it easy to run. It comes with a snap on pressure foot and 10 stitch options. This small 15-pound machine below can sew a wide range of fabrics. It also has reverse sewing capabilities, an automatic 4-step buttonholer and a free-arm. Today, children's sewing machines combine safety with easy operation. This allows children of all ages to have fun while being creative.